Railpictures.ca - Stephen C. Host Photo: With the Sarnia station at top right, CSX’s daily transfer is inbound to Sarnia withh a 12 car train while a CN yard job (Plank rd job?) switches the east end of “C” yard. Top left is the CN Roundhouse and “Bunkhouse” area, which a closer photo from 30 years earlier was posted by Mr. Pittman a few days ago. My photo was taken from Indian Rd overpass and gives a great overview of the area with lots of details – a train is also lined west on T2 through the tunnnel. Also notice in far top left the blue/white building? What was it used for? It has tracks leading right up to it… almost looks like an engine or car shop… not quite sure what it was used for now as I don’t believe anything goes inside it today. | Railpictures.ca – Canadian Railway Photography – photographie ferroviaire Canadienne. 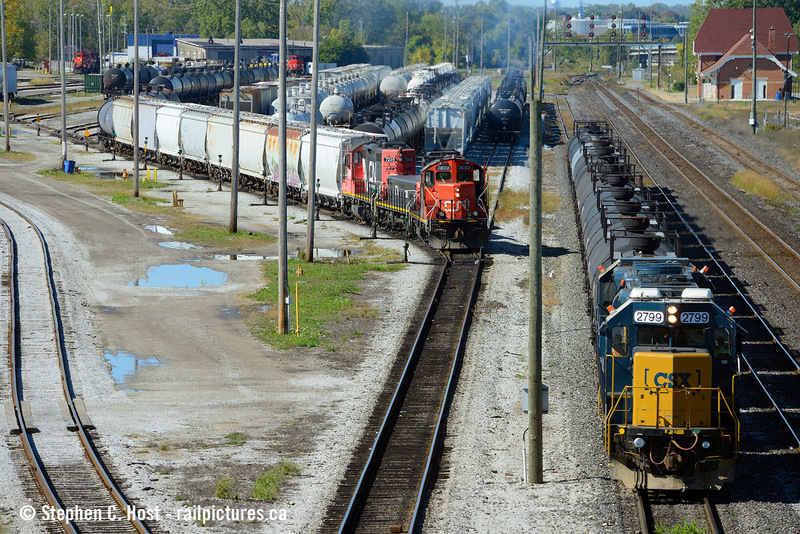 Caption: With the Sarnia station at top right, CSX's daily transfer is inbound to Sarnia withh a 12 car train while a CN yard job (Plank rd job?) switches the east end of "C" yard. Top left is the CN Roundhouse and "Bunkhouse" area, which a closer photo from 30 years earlier was posted by Mr. Pittman a few days ago. My photo was taken from Indian Rd overpass and gives a great overview of the area with lots of details - a train is also lined west on T2 through the tunnnel. Also notice in far top left the blue/white building? What was it used for? It has tracks leading right up to it... almost looks like an engine or car shop... not quite sure what it was used for now as I don't believe anything goes inside it today. Intention that all units are squeezed between the telephone polls? I applaud the attention to detail. I would have forgotten about the two in the background, only to be mad at myself later. also most if not all of the slugs are gone from the area. Heard may be retired.